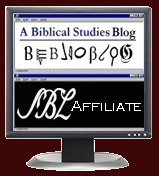 Biblical Studies and Technological Tools: "Can Real Academics Do Flash? - Teaching and the Costs and Benefits of Technology"
"Can Real Academics Do Flash? - Teaching and the Costs and Benefits of Technology"
I wrote one of the case studies for an article on "Technology, Pedagogy and Transformation in Theological Education: Five Case Studies" which appeared in the April 2007 issue of the Wabash Center journal, Teaching Theology and Religion. The other case studies were written by my colleagues, Steve Delamarter, Javier Alanís, Russell Haitch, Arun W. Jones and Brent A. Strawn. This article was not viewable except by subscription to the journal or payment for the individual article. According to the copyright agreement, however, I am now able to publish my contribution on my own website with the notice that "the definitive version of this article is available at www.blackwell-synergy.com." Mark Vitalis Hoffman wanted to help his students experience a fresh encounter with Jesus’ parables and ended up in the esoteric field of video gaming theory (ludology) for help in conceiving an environment and process interactive enough to do justice to all of the possibilities. This article feels somewhat dated to me. Ludology and video gaming studies and eLearning types of stuff are pretty commonplace now, but they were innovative, especially in the field of religious studies, when I started writing it nearly 2 years ago. As for the answer to the title of my article: No, at least for me. I learned enough Flash to do a single simple project, and then I never found enough time to go further with it. If you want to try it out, HERE is my experiential approach to one of Jesus' parables. HERE is a PDF of my section of the article. > This article feels somewhat dated to me.